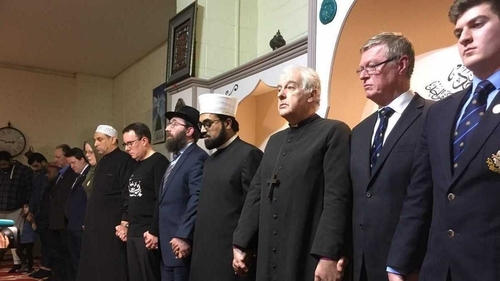 Church of Ireland Archbishop of Dublin Michael Jackson has been expressing his sympathy and solidarity with the Muslim people of New Zealand and Ireland at a memorial gathering for victims of last week's terror attacks in Christchurch. Addressing the attendance in the mosque in Blanchardstown run by the Islamic Centre of Ireland, Dr Jackson also extended his condolences on behalf of his church and other Christians, who, he said, were journeying with him in sorrow. Archbishop Jackson was accompanied at the gathering by the Ambassador of New Zealand to this country, Brad Burgess. The gathering took place immediately after the customary Friday prayers to mark the Muslim holy day. Dr Jackson said he felt "a deep sense of outrage and tragedy that even one person at prayer should die through calculated and premeditated violence". He included the entire population of New Zealand in his message of sympathy and recalled that he has had "the privilege and opportunity to work creatively and constructively for almost ten years" with the Muslim people of Ireland. Dr Jackson also said he wanted to echo the words of his counterpart, Archbishop Diarmuid Martin, earlier in the week who, he said had "effectively asked where it had disappeared to". He suggested that church-state dialogue is insufficient, partial and inadequate in contemporary Ireland and that the diversity of faiths needs to be integral to the new dialogue in Ireland as elsewhere in the world. He also praised what he called the ground-breaking Dublin City Inter Faith Charter, a partnership between the Dublin City Inter Faith Forum and Dublin City Council, which aims to build cohesion and create societies of inclusion and encourage dialogue of people of different beliefs and faiths.